The Annandale Arms Hotel stands in an imposing location on the west side of Moffat's extremely broad High Street, immediately to the south of the Town Hall. These two buildings between them sum up much of Moffat's history. This very attractive town grew to become Scotland's first spa resort in the century following the discovery of a mineral spring in 1633, and the Town Hall was built as the Moffat Baths in 1827. The Annandale Arms Hotel is rather older, being built in 1760 as a coaching inn serving traffic on the Carlisle to Glasgow road: and with the arch through to what is now the car park and the old stables at the rear it still looks every inch the part. Today's Moffat is a mile and a half from the M74 and remains a justifiably popular place to visit and to stay for travellers heading into Scotland. The Annandale Arms carries its age well, thanks to extensive refurbishments over the last decade and a half. Today it is a 3 AA Star hotel offering accommodation that has been only recently refurbished and a choice of dining options. The quality of the dining is very high and has led to the hotel being awarded 1 AA Rosette: you can read our dining review for the Annandale Arms Hotel here. The hotel's car park is reached through the arch immediately to the south of the hotel (we are probably not the first visitors to discover that the lane to the hotel's north leads to the police station!) You enter the hotel either via the fine main entrance from the High Street, or from the door near the angle of the rear of the building from the car park. 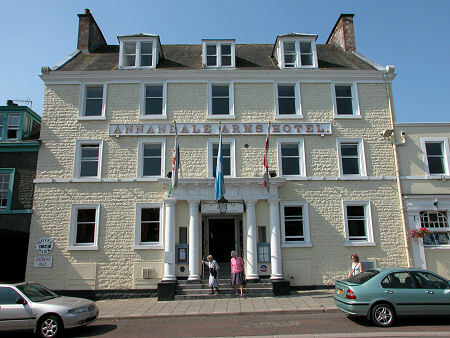 The heart of the Annandale Arms Hotel is the spacious L-shaped area which serves as the main reception and guest lounge. The quality of the welcome is outstanding, and this sets the tone for the friendly service which extends through every aspect of the hotel's operations: the benefits of a small and experienced team committed to offering visitors the very best experience are very obvious. Also greeting visitors on arrival is the hotel's oldest resident, a suit of armour strategically placed to catch your eye as you enter the main doorway. Passing through the lounge brings you to the attractive and comfortable wood panelled bar, with the panels of one wall decorated with local clan crests. The bar has its own entrance from the High Street, and impressive bar stools that appear to be equipped with old tractor seats. Head in the opposite direction from the reception and you come to the restaurant, a nice uncluttered room with windows to the front and rear. The first floor is home to a function suite comprising two rooms, the larger of which can seat 120 delegates theatre style or up to 44 boardroom style. There is also a private bar. In summer the first floor rooms are often used to serve afternoon teas to some of the many coach parties passing through Moffat. A range of meetings and functions can also be accommodated, and the Annandale Arms is registered for civil weddings and partnerships. The hotel accepts wedding bookings on an exclusive use basis. There are 16 en suite guest rooms at the Annandale Arms Hotel, including two larger family rooms and one with a four poster bed. The rooms have all been recently renovated and what you find is spotlessly clean and well equipped accommodation, all of which overlooks the courtyard at the rear of the hotel rather than the noisier High Street. The beds have pocket sprung mattresses and are very comfortable, and all rooms have digital TVs and free WiFi access. The hotel has grown organically over a period of 250 years and stairs between floors, and steps between different parts of the same floor, are frequently encountered. This inevitably has implications for disabled access: and while there is a disabled parking space close to the rear entrance, that is as far as it has proved possible to ease access. The Annandale Arms Hotel has an attractive frontage which helps draw you in from the busy High Street. It is good to be able to report that what you find behind the frontage meets, and in many respects exceeds, your expectations. There is an attractive simplicity in the decor which gives a modern feel while respecting the age of the hotel. The service is excellent, the public areas are welcoming and comfortable, and the quality of the food on offer is very good, amply justifying the 1 AA Rosette it has been awarded. You can read our dining review for the Annandale Arms Hotel here.